Ideas for putting a competition together and optional numerical scoring. Strength is demonstrated by one partner being lifted off the floor and endurance by the multi-dance performance. Besides the (often) lady showing the flexibility of her body, the couple demonstrates versatililty in the variety of their choreographies across the styles and choice of steps. Skill in expressing five dances differently is similar to being able to execute all four of the swim styles in Olympic competition, but the couple has demonstrate those skills in back-to-back dances. 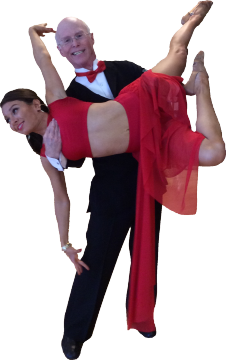 Fusion Ballroom demonstrates athleticism (strength, endurance) through versatility in the fusion of International Standard, International Smooth and Theatre Arts. Fusion Latin combines International Latin dances and Theatre Arts as does Line figures with picture lines and modern dance shaping can also incorporated. Events can range from single couple performances to detailed numerical scoring of competitors. Competitor formats can be single couple performances each numerically scored with the highest score winning or more traditional ballroom competitions with multiple couples on the floor. 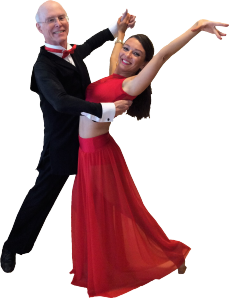 Like many Olympic sports, fuson Ballroom/latin can be evaluated mostly quantitatively based on the blend of steps and figures from the different syllabi and theatre arts moves. The best dances from an evaluation perspective are an even mix of styles. Formal Standard, Smooth, and latin scoring involves adding points for figures based on their difficulty as determined by the syllabus. Theatre arts lifts, nominally, score higher the higher the lady is lifted off the ground. Like gymnasticsm diving, and other sports, deductions are applied for figures that are not perfect. Unlike traditional ballroom competitions where the winner is chosen based on placements in the individual dances (using the Skater’s Algorithm), the scores are added like in the gymnastics all-around competitions. Besides figure evaluation (above) a category selection option is available for non-qualifying Olympic events.